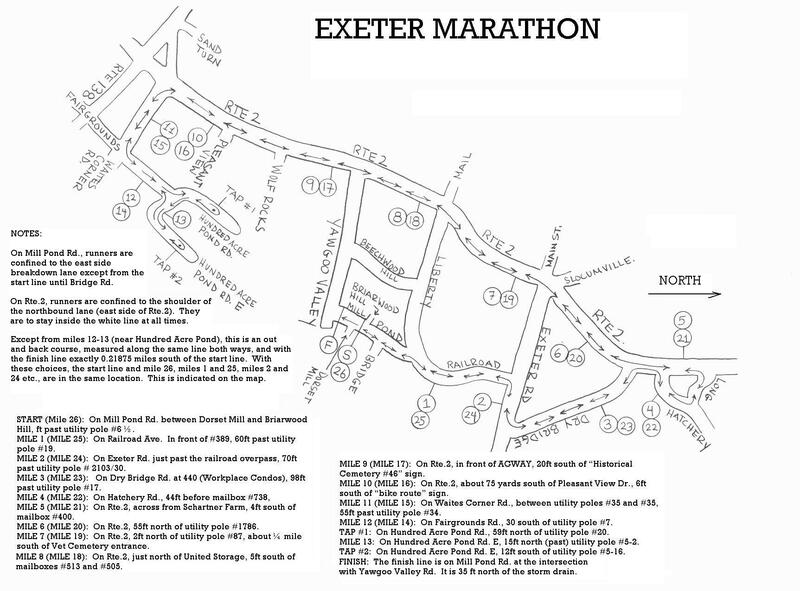 There are now 5 days to prepare for the Exeter Marathon. If you are running (or are just interested in the race) then here is everything that you need to know about the race. If you are interested, I wrote yesterday about my own plans for the race as race day gets closer. The race this year is going to be very small, and quite likely there will be fewer than a hundred finishers. That number will grow fast over the next few years, I have no doubt. Registration is limited to people who can run the qualifying standard, with no exceptions. The standards are 5 minutes faster than those for the Boston Marathon across the board. One thing that I really like about this race is that it is extremely reasonably priced at only $40. Not only that, but 40% of each registration fee goes into the prize purse. Day-of and day-before registration is still only $60. If you aren’t sure if you want to run a small race with so few people, you should read “Why Should You Run a Small Marathon?” which was written by the race director. If you’ve never run a marathon this size, then you should give it a try. You may not like it, in which case you now know to avoid them. More likely, though, you’ll discover that the advantages far outweigh the disadvantages and that a small race can cater to the runners much better than something that is run by thousands of others and costs an arm and a leg just to get into. The original course isn’t going to be used because of construction, so there’s an out-and-back course this year. Most likely, this course will not be used more than the once, but that’s okay. It beats having a multi-loop course. You can see the course map at right (click for full size.) The map isn’t to scale but it does a good job of showing the shape of the course and describes where every mile marker is located. Mile markers will be 2 foot by 2 foot sandwich boards painted white with large black numbers on them. Not only will every mile be clearly marked, but each half mile will be marked with a yellow hash on the road. There is a white hash on the road to mark the half marathon, but there will not be any other special markings. The finish line is far enough beyond the starting line when you return so that every mile corresponds with one another. In other words, mile 1 is at the same place as mile 25, mile 5 is at the same place as mile 21, etc. 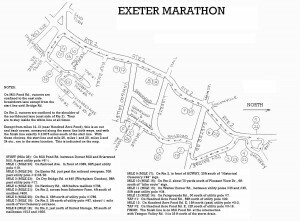 See the course map for clarification if necessary. There are 5 aid stations that you pass 12 times, roughly every 2 miles. Every aid station will be stocked with water and Gatorade with a minimum of 2 volunteers at each to help the runners on their way. As such, despite this being a small race, you won’t need to carry your own water. If you need any other amenities, you’ll need to carry your own. It’s still easier to qualify for than New York City if you want to bypass the lottery and don’t mind spending 4 or 5 times as much money, heheh.